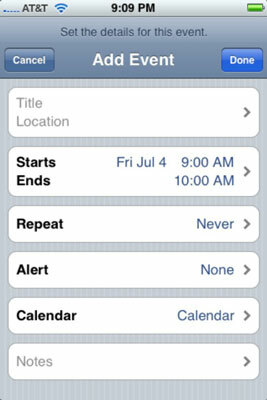 Your iPhone has a calendar that lets you add personal entries. With your busy schedule, keeping your calendar entries up to date can keep you from missing those all-important appointment and to-do items straight. 1Tap the Calendar icon at the top of the screen. Then tap the List, Day, or Month button. 2Tap the + button at the upper-right corner of the screen. The + appears whether you are in List, Day, or Month view. Tapping + displays the Add Event screen, shown here. 3Tap the Title/Location field and finger-type as much or as little information as you feel is necessary. Tapping displays the virtual keyboard. a. Tap the Starts/Ends field. b. 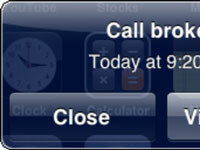 In the bottom half of the screen that appears (shown here), choose the time the event starts and then the time it ends. Use your finger to roll separate wheels for the date, hour, minute (in 5-minute intervals), and to specify AM or PM. It’s a little like manipulating one of those combination bicycle locks. c. Tap Save when you are finished. 6If you are entering a birthday or another all-day milestone, tap the All-day button so that On (rather than Off) is showing. Then tap Save. 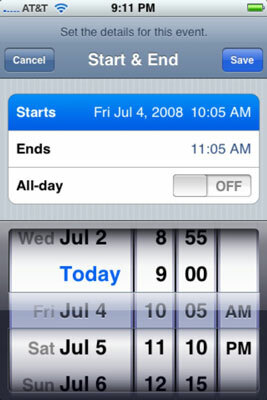 Because the time isn’t relevant for an all-day entry, you’ll note that the bottom half of the screen now has wheels for just the month, day, and year. 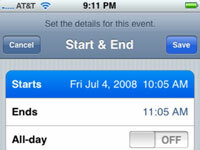 7If you are setting up a recurring entry, such as an anniversary, tap the Repeat window. 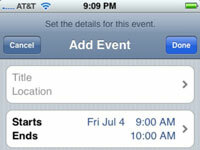 Tap to indicate how often the event in question recurs, and then tap Save. The options are Every Day, Every Week, Every 2 Weeks, Every Month, and Every Year. 8If you want to set a reminder or alert for the entry, tap Alert. Then tap on a time, and then tap Save. Alerts can be set to arrive on the actual date of an event, 2 days before, 1 day before, 2 hours before, 1 hour before, 30 minutes before, 15 minutes before, or 5 minutes before. At Alert time, you’ll hear a sound and see a message like the one shown here. Are you the kind of person who needs an extra nudge? You can set another reminder by tapping on the Second Alert field. 9Tap Calendar to assign the entry to a particular calendar and tap the calendar you have in mind (Home, Work, and so on). 10If you want to enter notes about the appointment or event, tap Notes. Type your note, and then tap Save. A virtual keyboard pops up so that you can type in those notes. This indicates that you have finished entering everything.